While we know that the ancestors of flags are almost as old as civilization itself, legend has it that flags existed even longer ago… in a galaxy far, far away. That’s right, there are flags in the Star Wars universe! And let me confess something: while I love flags (enough to start a flag website), I have loved Star Wars for a much longer time. I was also lucky enough to be picked to be a guest host on the Star Wars Minute podcast! So in honor of my podcasting debut (which you can listen to here), we are going to look at the flags of Star Wars! The first canonical flags that appear in the Star Wars universe are found in Episode I: The Phantom Menace during the Boonta Eve Classic podrace. Before the actual race, a flag representing each racer is flown on the starting line, known as “the flag parade” (it even has its own theme music in the movie). While the majority of the flags are a combination of traditional rectangular flags and pennants, there are quite a wide variety of designs, colors, and aspect ratios. This could be an indicator of popular flag designs used in the racer’s home world. Entrance to Maz Kanata’s castle. 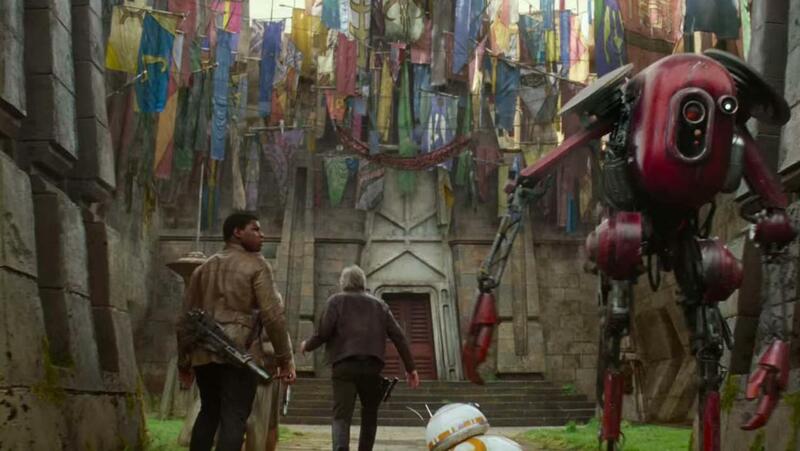 Flags make their second canonical appearance in Episode VII: The Force Awakens when Han Solo, Finn, Rey, and BB-8 make their way to visit Maz Kanata. Before entering her castle, our heroes walk through a courtyard with dozens of flags suspended above. Thanks to the keen eye of many fans examining trailer footage, we knew that several of these flags were the same pod racing flags we saw in Episode I before The Force Awakens was even released. In addition, we can see that one of the flags shows Mandolorian crest, worn on Boba Fett’s armor. In typical Star Wars fan fashion, many theories were proposed as to what these flags meant. Some are even suggesting that the Mandolorian crest meant that Boba Fett is still alive and that we might see him again in the new trilogy. To me, that seems a bit farfetched. It seems pretty clear that Maz is a just collector (and apparently a vexillologist!). No more, no less. While flags representing races, planets, groups, etc. are never really shown in the original films or the prequels, they do appear in the Extended Universe and in Star Wars video games. One of the most notable examples is Star Wars Galaxies: An Empire Devided, a 2003 massive multiplayer online role-playing game (MMORPG) by LucasArts. Many of the major locations from the movies such as Tatooine, Yavin 4, and Endor are represented by flags. In my opinion, these designs are a mixed bag. Some are quite good (Corellia is a particular favorite). But many leave a lot to be desired (Endor, Yavin 4, and Dantooine for example). As one would expect, fans have made real life flags inspired by Star Wars. The classic example are the symbols of the Rebel Alliance and the Empire, both of which translate perfectly to flags. But there are plenty more examples. Recently, a New Zealand art director by the name of Scott Kelly designed more than 100 flags for worlds in the Star Wars universe. I didn’t get a chance to look at all of them yet, but some that I have seen are quite good. If you are a Star Wars fan, be sure to check out the Star Wars Minute podcast!